October 15, I am teaming up with Black Market Burlesque to bring you an evening of unbridled wonkery! 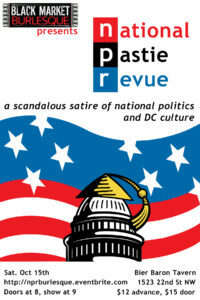 NPR: National Pastie Revue: a scandalous satire of national politics and DC culture! Do you wonk it up in DC? Do you resent your unwitting part on the stage of National Politics? Do you dread being offloaded from a train because a tourist is holding the doors open? Do you believe that brunch is DC’s state* sport? Or do you simply enjoy the dulcet tones of National Public Radio on WAMU soothing your ragged, overworked soul? 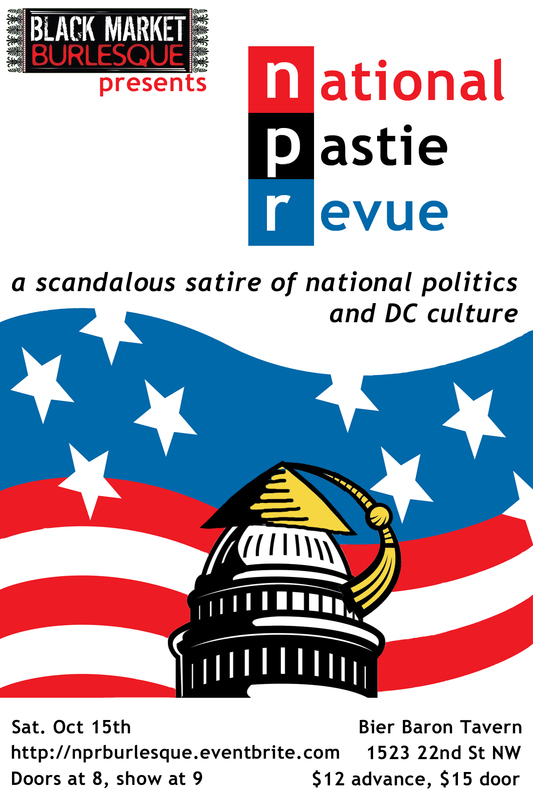 Join Black Market Burlesque and Isabelle Epoque, just in time for the election, as they bring an ensemble cast to the Tiny Stage and serve up your deserved dose of Fresh Fare in the National Pastie Revue! as your favorite education, news, & cultural analysts, along with at-the-scene current events… and interviews!